Just What Did Al Prosser Do in The Space Program? Up until October 1997, I maintained special computer applications to support the contract to supply software for the onboard computers for the Space Shuttle. I keep this page so that when someone asks what I did there, I can tell them to look at my web page for details instead of talking for 5 minutes before realizing that they do not understand what I am talking about. Anyone capable of understanding, or at least appreciating what I do, is usually capable of reading it here. There was an article a coule years ago about my former workplace in a magazine called Fast Company. It is called They Write the Right Stuff and it can be accessed from https://www.fastcompany.com/28121/they-write-right-stuff (note new archive URL). 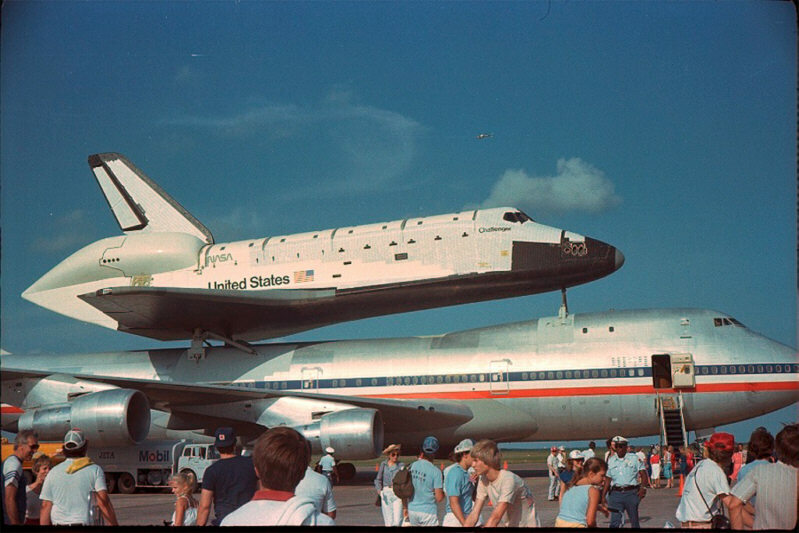 More information on the Space Shuttle can be found at http://spaceflight.nasa.gov/ where information is kept on the latest flight. If all this is not detailed enough, see also Al's Detailed Work History. There will be some specific cross references from this file to there as well. I used to work for Lockheed Martin Space Mission Systems & Services Company on the contract to NASA for the Software for the Onboard Computers for the Space Shuttle. I was a Senior Engineering Systems Analyst (or some similiar title). I used to work for IBM Federal Systems, beginning as a COOP in 1982, then "permanently" in 1986. I went with the rest of the contract to Loral when the division was sold to them, then to Lockheed Martin when the companies merged. Requirements Analyst and Verifier for the special Link Edit program for the AP101 computers on the Space Shuttle. This program has to handle the complicated overlays to get around the small memory on the AP101S computers. Verification involves analysis of the change to be tested, writing up a test plan, creating and running test cases with the conditions to be tested, and written analysis of the results to be reviewed by a peer and archived for future reference. With the AP101 Linkage Editor (LE for short), this can involve searching 10s of thousands of lines of binary data, editing program modules in hex to change one or two bits to get a particular error message, and changing JCL to pick up the changes. The printout (if it was printed) for a LE run for a particular mission is more than half a box thick. I get a lot of use out of the ISPF edit/browse hex mode and SuperCompare on the mainframe, and the hex/decimal/binary calculator program on my workstation. Due to my expertise on the function of this program, (and the departure of the real guru), I was sometimes called on to be one of the people to trace down unexpected conditions in the flight software, especially if they could be caused by Link Editor or System Architecture changes. The current program is written in IBM 370 Assembly Language, and I was also on the team (as a verifier, requirements analyst, and domain expert) to re-engineer this program using Object Oriented methodology into C++. Verifier for several reusable C++ classes used in various re-engineering projects. The compiler we began using on MVS from SAS does not have a rich library of reusable components so as we created classes for various projects, we tried to make them reusable. I also verified that these classes worked suitably to be reused on other projects. I was responsible for testing classes used for Strings, Dynamic Dataset Allocation, Library (similar to a path), a Parser/Scanner generator, Smart Memory (shared pointers), Bitstrings, and a standard error message class. We were also working on classes to read, write and manipulate executable code for AP101 computers to help with the new Linkage Editor for the Space Shuttle computers. Our project did not have experience with Object Oriented Methods until recently. Our processes were very good for the maintenance mode we are in for most of our software. (We were one of the first to get CMM Level 5 rating). The verification of supposedly reusable C++ components required some major changes to the process, most dramatic was the need for the verifier to be able to write driver programs (as opposed to driver data) to exercise different program paths. Also, since some of the code was extracted from a written application and made reusable, in most cases I have had to verify that it works before the requirements are finalized. I wrote up a couple page verification approach to use until we finalized changes to our official procedures. Developer/ Maintainer for various programs used to test the process that reconfigures the Flight Software for the Space Shuttle for each flight. I personally maintained 30-40 thousand lines of very complicated, if mostly stable, code. I have designed and written a couple approximately 10 thousand line applications and several smaller ones. These kinds of applications are written using ISPF and JCL to run background programs written in PL/I on NASA's MVS mainframe computers, and are written in PL/I, Clist, Rexx, and the ISPF components. I helped maintain the ISPF primary option menus for the project. Recently, as part of a cnoversion to a newer operating system, I converted the menus from the old Panel language to DTL, which is related to HTML. ISPF is kind of like Windows for mainframes. I later created and presented a course (overview, really) on this type of programming. NASA certified RACF Group Administrator for several departments. I have been responsible for monitoring the security protection of some of the department level datasets. I also processed userid requests, reset passwords, etc. Occasionally act as a PL/I, ISPF, or Clist expert. Sometime maintainer of a number of user productivity types of utilities used on NASA's MVS (IBM or compatible) mainframe. I wrote and maintained a prototype application that helps the documentation specialists manage versions and revisions of the many requirements documents and user's guides written Bookmaster on the mainframe. They can edit and print a working copy without worrying about which file has the original. I maintained the application that builds changes to the IMS transactions written in ADF for our configuration management data base. (Since 1986!) I suspect that by now they should have the databases converted to ORACLE. Provide input to quality standards and procedures. I did this quite a lot over the years. I have seen a lot of evolution of the state of the art of software engineering from the trenches. Backup or Department representative to a number of configuration control boards. I have been a primary representative to most of them at one time or another. OBS is ISO 9001 certified, and has a Software Engineering Institute (SEI) Capability Maturity Model (CMM) rating of 5. (See www.sei.cmu.edu for more information on CMM. There were boards for change control for the major tools, discrepancies (errors) for the major tools, configuration control for minor tools, and some that discussed procedures. There would also be projects such as upgrade to a new operating system version or Year 2000 testing. Since I started at IBM, I have worked on a wide variety of tasks that I am not currently responsible for. I maintained the PL/I, ISPF, JCL programs that used to build the internally used tools on the mainframe. I wrote much of the interface and error checking while I was still a college COOP. It has since been replaced with an ORACLE application. I wrote the prototype for the program to track changes and dependencies in the internal tools. It was used for about 5 years, but has been replaced by an ORACLE application. For several years, I was one of the original representatives to the board that tracks changes to the less critical, internal tools, and helped draft original standards and procedures (now called the Backroom Tools Control Board). While in college, I wrote the prototype for the program IBM used to filter opinion survey results so that answers could not be associated with individual employees. Perhaps that is why I am so adamant that a means for upper management to get anonymous feedback from employees is so important. It improves morale and productivity and keeps middle management more responsible. I wrote a large (>10 KSLOC) ISPF-PL/I-JCL application that starts and checks all the batch jobs to build a software release for either the Flight Software or Application Tools Software for the Space Shuttle. The jobs have to execute in a particular order, and the application creates the JCL, submits the jobs, and checks that each job completes before any jobs that depend on it are run. Did some work with FOCUS 4GL query language for getting reports about computer charges. PL/I - 14+ yrs experience, writing and maintaining scores of thousands of lines of code. Much code for complex ISPF or batch programs, occasionally one or two to access IMS databases or VSAM datasets. I wrote some of the PL/I coding standards for our project. I have written a small amount of PL/I code to access IMS databases. Clist - a command language on MVS mainframe. The various languages for using ISPF on an MVS mainframe. 14+ years experience. HAL/S - a special language used to write software for the Space Shuttle. JCL - a batch language for MVS computers. C++ - mostly on IBM mainframe, but also on OS/2 work stations. About 4 years off and on. I worked on a reusable library of classes for strings, containers, and lexical scanner and parser generators. I was on the design team and was the independent verifier for most classes. I have used Lotus Notes for about three and a half years. Paradigm Plus - an Object Oriented CASE tool. I have used it to document design of scores of classes. I did some script customization. I used it for some early design work that has transitioned to others. REXX - here and there on workstation and mainframe. Used for new applications instead of Clist. Script/Bookmaster - a SGML documentation markup language related to HTML. I used them for about 11 years. I write some HTML from time to time. I have used Lotus Smartsuite and MS Office applications for documentation at work or personal or charity projects at home as needed for a few years. I have set up several Access databases for charity. Ada - took a class for a contract we did not win, and a research experiment to compare an automatic code generator against a human programmer (me). For the application domain, my Ada code was an order of magnitude faster than the machine generated code. Occasionally I was a reviewer for code written in a FORTRAN or Assembly dialect. PVS - a special tool for using Formal Methods to do logical proofs. Can be used for checking requirements. I took a class at NASA Langley in the use of this tool. They used it to check the requirements for adding GPS support to the Space Shuttle navigation software. Most of my work is done on IBM Compatible mainframe computers running MVS versions and OS/390. I have been using OS/2 since version 1.3 came out. I have used a wide variety of OS/2, DOS, and Windows applications.